You'll be £16.99 closer to your next £10.00 credit when you purchase Fabulous Flying Boats. What's this? The history of the development and operations of flying boats in the early twentieth century is a vibrant one, full of colourful characters and experimentation. In 'Fabulous Flying Boats', Leslie Dawson captures this spirit of dynamism, reminding us of the most successful early pioneers of the seaplanes development, including a little known and oft-overlooked rival to the Wright Brothers, working to put their mutual successes in context. He goes on to describe, in clear and vivid detail, and using first hand-accounts, what it was like to be aboard one of the resulting huge passenger flying boats, as air crew and as a passenger. He also recounts the part played by the military boats inevitably seconded to such use. Incredibly well researched, the narrative embraces the globe-trotting air routes, from Europe to the Far East and to the Americas, and is well supported with evocative images from private and corporate collections, and the worlds aviation museums. The in-depth Appendix is virtually a book in itself. This book is sure to be a welcome addition to any Aviation enthusiasts library as it covers a particularly important period of Aviation development which formed a fertile environment for a host of young experimenters. The process of development continues to this day. This is an extremely well-researched and well-written book that would make a great documentary. This book is a great review of the Flying Boats and the author’s personal, easy style make the book a relaxing read. The photos are a joy to look at as well. At over 300 pages, it takes a while to read, but it is well written and never fails to hold one's interest. I found every page to be interesting and informative. A book that enjoyed reading as the subject has always held some fascination for me. I'm sure you will find it equally absorbing; a book that I highly recommend. 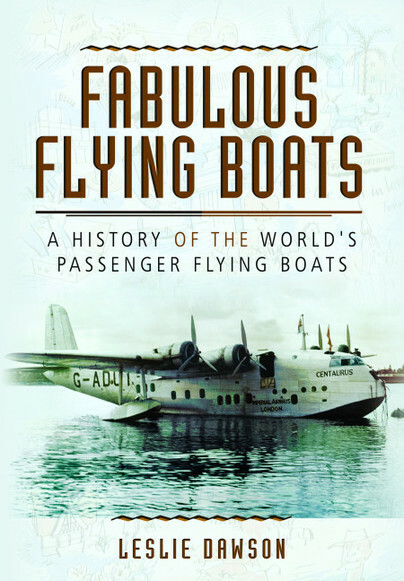 A great book telling the history of the world's great passenger flying boats, a type of aircraft not seen anymore. Not a photo book but a tale covering all the major brands and models and their manufacturers. A thorough study of commercial/civilian flying boat operation from the dawn of aviation to the present day. All in all a very nice book and much more successful than some other previous books on the subject. Engagingly captured in vivid detail, with first-hand accounts of piloting and travelling in these graceful behemoths, this prodigiously researched, detailed and lucid narrative is also well-illustrated with evocative images from corporate, private and museum collections and includes a matching informative appendix. This 320-page hardback – despite its staggeringly comprehensive factual content – is no dry textbook...It is packed with funny, tragic, whimsical and wistful first-hand anecdotes of those who flew – or were flown in – flying boats. It is a labour of love and reflects the feelings that flying boat pilots had for their craft. A lively narrative... fun to read and offering many useful details. This incredibly well-researched book embraces the early globe-trotting air routes covering America, Europe and the Far East. It draws upon evocative images and accounts from both private and corporate collections, as well as the world’s aviation museums. These important developments in aeronautical history are given an excellent treatment and this manuscript is bound to become the reference work on this niche of aeronautical history. There is no doubt that the author is deeply enthusiastic about his chosen subject and that he shares, along with many others, an abiding love of the wonderful flying-boat era. It can equally be asserted that he has assembled a huge amount of information that will be of great use to anyone wishing to learn a huge amount of information that will be of great use to anyone wishing to learn about or start researching many aspects of waterborne aviation. The very wide selection of photographs is interesting, many of which have come from private collections. The appendix which lists details of more than 300 passenger flying-boats is well set out and very useful. Fabulous Flying Boats illustrates so much, for just a small example. The production standards for the book are quite high, more than the normal...and is an excellent gift. Dawson writes history like a person who loves what he is talking about. One can hardly imagine a better book or a better written book. Perhaps there will be a Fabulous Flying Boats II in the near future? We can only be so lucky. Leslie Dawson was born in Southgate, North London. An enthusiastic member of No 85 Squadron Air Training Corps, he first flew from Hendon, now the home of the RAF Museum. He went on to train Glider Pilots at Christchurch Gliding School, a prestigious Aviation establishment. Surrounded by planes for the majority of his working life, his enthusiasm and experience mean he is well placed to offer such a history. He is the author of Wings Over Dorset, a book depicting the county's aviation history. The success of this title secured the author a series of television interviews, including one with the BBC.